There are two undeniable truths when it comes to shooting: Firearms skills are perishable, and mechanical failures will eventually happen. Both of these are reasons why shooters need to practice clearing malfunctions. I’ve spent more than two decades teaching soldiers, police and military contractors. When someone is under stress, whether induced by competition or combat, he will do what he has trained to do. Thus, a person who has not trained to clear a malfunction will do what he has trained to do: nothing. When he pulls the trigger and his gun doesn’t go “bang,” he’ll freeze. He might try to figure out how to fix it, or he might wait for the problem to correct itself. While the former option is better than the latter, both waste precious time. If someone is shooting at you, you don’t have time to learn how to fix a malfunction. The time for that was long before. The best option is to perform an immediate-action drill, which is just what it sounds like: performing an action right away without even taking time to think about it. The faster you get your gun running again, the faster you can resume saving lives — yours or someone else’s. The only way to ingrain this in your mind to the point that it becomes a reflex will sound painfully familiar: practice, practice and then practice some more. With modern arms and factory ammunition being as reliable as they are, unintended malfunctions are few and far between. Not to worry though. Dummy rounds provide a way to set up failures so you can practice clearing them through the course of your training regimen. Dummy rounds are nothing more than objects shaped like cartridges that will load into a magazine, chamber and eject but which have no powder and no primer. As such, when the firing pin strikes them, there is no chance of a negligent discharge. This makes them indispensable training tools, specifically in the realm of malfunction clearing. There are two main types of dummy rounds commercially available: units made entirely out of plastic and units with metal cartridges and some plastic components, such as primers or “bullets.” The latter will hold up better, as the rims of the all-plastic models tend to wear down and break after repeated use. The slide is fully in battery (meaning all the way forward), but the chamber is empty. When the trigger is pulled, there is a click from the hammer falling or the striker releasing, but nothing happens. This is a very common malfunction, and the leading cause is the shooter forgetting to chamber a round. The next-most-common reason is the shooter failing to properly seat the magazine, which means that when the slide went forward, the cartridge on top of the magazine was too low to be stripped off and chambered. Bring the gun in, rotating it so you’re looking at the side of the slide. Tap the magazine to seat it fully. Bring your hand over the top of the slide and forcefully rack it to the rear. Punch the gun out, reacquire the target and shoot (if necessary). Don’t train yourself to automatically shoot at the end of the drill or that’s what you will do in a real-time shooting incident. Do a threat assessment; in the time it took to clear that malfunction, your adversary might have surrendered, run away or lost consciousness. If you always train to shoot at the end of the drill, you will probably do so on the street, and if your attacker is no longer a threat when you shoot, you could face prison, crippling lawsuits or both. 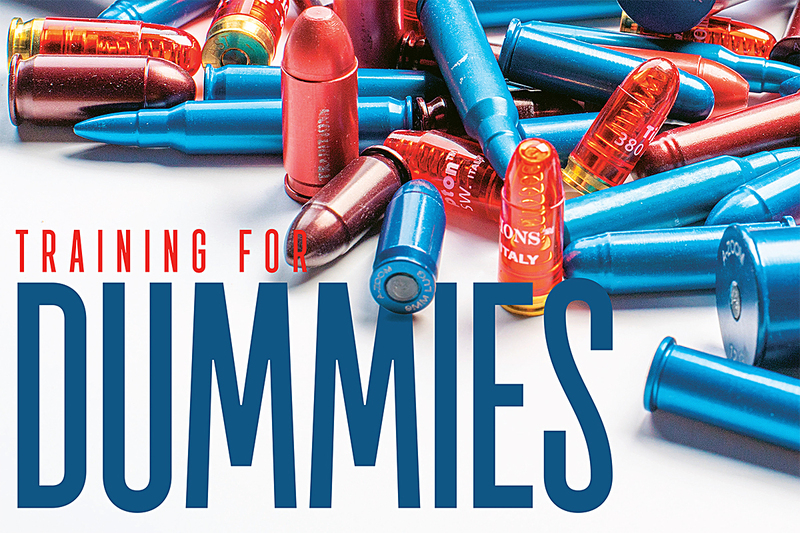 How to Set Up: Include a few dummy rounds when you load your magazines on the range. As you shoot, you will encounter the dummy rounds and can take appropriate action. This type of malfunction is caused by the slide not being in battery. When you pull the trigger, there isn’t even a click. Nothing happens, and the two primary causes are a spent cartridge case not fully ejecting or an empty magazine. A spent case stuck in the ejection port is often caused by limp-wristing the pistol. The recoil energy isn’t sufficient to move the slide fully to the rear, and the used case gets stuck, which means there almost certainly won’t be a round in the chamber either. Bring your hand over the top of the slide, roll the pistol so the ejection port is pointed toward the ground and forcefully rack the slide to the rear. By properly rotating the gun, the spent case will fall out when you rack the slide. Exaggerate the rotation if the dummy round doesn’t fall consistently. Drop the empty magazine while retrieving a full magazine. Insert and properly seat the magazine. Bring your hand over the top of the slide and forcefully rack and release it. How to Set Up: Set up for the first version of this malfunction by starting with a fully cleared pistol. Pull the slide to the rear enough to allow the dummy round to fit and insert it. Ease the slide forward so you don’t crush the case rim on the dummy. The second type can be set up by loading only a few rounds into your magazines. You’ll expend fewer rounds before running dry, which will save money when practicing this drill. A double-feed is a major problem caused by a spent case failing to eject and a new round trying to feed up into the chamber. What you’ll first notice is a “mush” trigger, which should immediately cause you to execute a Type 2 drill. It won’t clear the malfunction, but it’s faster than assessing what’s wrong and only then trying to clear the malfunction. After the tap-roll-rack, your slide will still be out of battery. Lock the slide to the rear to relieve the tension on the rounds causing the jam. Strip the magazine out of the pistol. Just hitting the mag release won’t work, so press and hold the mag release and pull the magazine out of the gun. Even though there might be rounds in this magazine, drop it on the ground. Rack the slide several times to clear the offending rounds. Don’t ride the slide forward, or the extractor might not grab the round in the chamber. Jerk the slide to the rear and release it with all of the force from the recoil spring. After the jam is clear, insert a new magazine and rack the slide. How to Set Up: Lock the slide to the rear on an empty pistol. Insert a dummy round into the chamber and then insert a magazine loaded with dummy rounds into the gun. Press the magazine release to create the malfunction. Even in this age of high-tech polymer auto-loaders, there are still plenty of us who carry wheelguns, and I have to admit that, in the summer months, I carry a snub .38 more often than my 1911. One significant advantage to revolvers is reliability, but one drawback to revolvers is they are usually limited to five or six rounds. If you carry a revolver for self-defense, you will need to be able to reload it quickly, and dummy rounds will let you safely practice combat-reloading your revolver. As with all reload training, for safety purposes, ensure there is absolutely no live ammunition in the gun or even in the room. Mistakenly grabbing a live round instead of a dummy round must absolutely, positively never happen. Bring the revolver in while hitting the cylinder release. Tip the barrel up while opening the cylinder and passing the middle and ring fingers of your support hand around the cylinder. Hit the ejector rod to clear the chambers of spent rounds. Holding the cylinder with your support hand, retrieve a speedloader with your strong hand. Tip the barrel down and insert the cartridges into the chambers. Release the cartridges from the speedloader. Close the cylinder, let the speedloader fall to the ground and index the cylinder. Reloading a revolver looks more complicated than it really is; with practice, you can be almost as fast reloading a revolver as you are with an auto. Since the release mechanisms of speedloaders vary, make sure, so you only have to master one technique. And if you carry your speedloaders in a pocket, that’s your speedloader pocket — don’t put anything else in there. Loose change can get lodged between the cartridges and ruin your day. As you get more comfortable clearing misfires, you can add greater degrees of difficulty. Set up a pistol qualification course and, when you load your magazines (or when you have a friend load your magazines), mix in dummy rounds and don’t load all magazines fully. Set up a double-feed in your pistol and run the course. Since you won’t know when you’ll encounter a dummy round or run dry, you’ll be surprised when it happens. This will give you experience clearing malfunctions under pressure and allow you to build your skills to the next level. When you begin to practice training in clearing misfires, don’t worry about rapid execution. Learn the steps and follow them in sequence; as they say, slow is smooth, smooth is fast. It is far better to clear a misfire slowly but correctly than quickly but wrong. Discover how you can join nearly 300,000 responsibly armed Americans who already rely on the USCCA to protect their families, futures and freedoms: USCCA.com/gunsamerica. Yes, . . . good article, . . . and I totally concur with Steve on the “tap and rack” verbage, . . . it borders on being an acronym known only to “those in the know”. Yes I know what it means, . . . and many others do as well . . . but someone who has not been an active shooter for very long, . . . or dropped out a few years back and is trying to get back in the game, . . . they are left out in the boonies trying to figure it out. “Seat the magazine and rack the slide” is only a few more syllables, and is far better at identifying the actions needed than a simple tap and rack statement. But other than that, . . . great article. Well, at the risk of ridicule, I suggest the term “tap” be replaced with “whack”. Whack and rack is easy to remember, whack rhymes with “rack” and it correctly represents the action required to seat the magazine. Good article. This is the way I was trained and this is something every person who carries a sidearm should practice. While reading through it, however, I was struck with the ridiculousness of the term “tap” to describe how we correct an unseated magazine. The terms “tap and rack” roll off an instructor’s tongue like a food order at Applebees. To our students this probably adds to confusion and does not portray the required corrective action. I know this term has been used for decades, but it is an anemic verb, compared to the true positive force required to seat a loaded magazine into a firearm. What we are implying by saying “tap” is “lightly pat the magazine into it’s correct position.” Perhaps “mash” or “thump” or some other more forceful verb could be coined to accurately teach this corrective motion.